Precision patterning in AutoCAD is my obsession - I am researching the wonderful historical world of corsetry, creating unique and contemporary designs as well as bringing forgotten patterns to a modern audience. I am fanatical about corsets and a complete cadaholic. I have been using AutoCAD for many years and started creating my own patterns in 2014 which are commercially available through Etsy and my website. It is a marriage made in heaven for me and I have taken some time off from my paid employment to explore and develop this artform. I want to bring to life the historical patterns of the past, but give them a modern twist for the discerning corset maker of today. As a patron of mine you will share my love of corsets and make them for yourself, friends or clients. You might be frustrated at the number and variety of patterns commercially available - it is a very niche market after all. You might not have the time to draft numerous patterns in different sizes - it is a time-consuming affair. You will relish the challenge of a new corset pattern for very little outlay, and maybe just like the idea that somebody has taken on the challenge of patterning designs that were once ubiquitous but have been lost in the midst of time. You may not make every pattern of course but the designs may inspire you and you are perfectly at liberty to amend them to suit your own needs and designs. For anyone pledging for the 'gorgeous corset pattern' tier there will be under-busts, over-busts, cupped corsets, 2 - 20-panelled corsets. There will be gores and gussets. There will be full instructions. All patterns will be graded from size 8 - 22 (UK), 4-18 (US), and plus sizes will sometimes be included. For anyone pledging smaller amounts there will be information - hint, tips and photos of what I'm working on. If you pledge for the $10 tier you will receive CAD hints and tips and Youtube videos each month that will teach you patterning using CAD software (DraftSight - note: there is now a $99 fee for this software). If you work through the tutorials you will become proficient in CAD and be able to digitally draft your own designs. 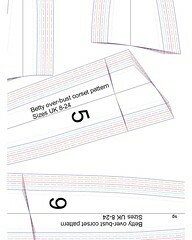 An AutoCAD designed corset pattern in sizes UK 8-20 (US 4-16) posted usually at monthly intervals. As well as getting your monthly pattern you will be able to view digital corsetry patterning tips and tricks using $99 software (Draftsight). Every month I will post simple learning snippets - from setting up a drawing, to creating made-to-measure corsets. This month's design drafted specifically to your measurements. Useful if you are not great at altering patterns to fit, or fall outside the pattern's measurements. I'm definitely not going back to paid employment if I reach this goal. If this were to be ever possible in such a niche environment it means I have built up my reputation successfully and the corset community in general are being supportive and would like to see me continue.